Now that the winter ski season in Whistler is well underway, we’re giving you an overview of the top winter activities on offer (besides skiing and snowboarding of course!). The winter activities here are so good that Whistler has been ranked as the Number 1 resort in North America for off-hill activities by the readers of SKI Magazine, so what’s all the fuss about? The winter entertainment season kicks off for real with the Whistler Film Festival in early December. Now in its 17th year, this festival has grown in size and reputation, and last year featured 86 original and innovative films from around the world. As well as screening films, the festival also includes a range of parties and attractions, giving visitors the opportunity to meet and connect with the film-makers themselves. A more regular, but just as entertaining, winter spectacle is Whistler Blackcomb’s Fire and Ice Show. 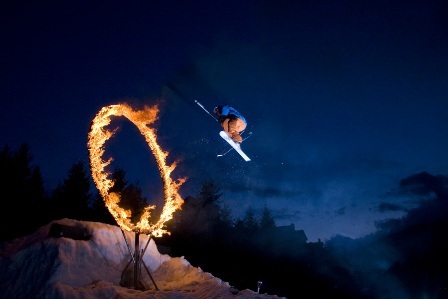 This impressive display involves Whistler’s best skiers and snowboarders jumping and flipping through a blazing ring of fire to the beat of a live DJ, and ends with a spectacular show of fireworks. Running every Sunday from December 18th – April 2nd, this is a superb evening of free, live entertainment. Blackcomb also hosts ski and snowboard competitions throughout the year, but the biggest event comes at the end of the winter season in the form of the World Ski and Snowboard Festival which takes place in Whistler towards the start of April. This 10-day long mountain culture festival is full of amazing events including free outdoor concerts, photography and film showcases, skiing and snowboarding competitions and non-stop nightlife. Alongside these organised festivals and shows, Whistler boasts a wide range of other outdoor activities, giving you the chance to take a break from skiing and snowboarding and see the mountains from a different perspective. For a more restful sightseeing experience, take a ride on the Whistler Peak 2 Peak 360 – a glass-bottomed gondola which offers stunning views of Whistler Village and the surrounding peaks, lakes, glaciers and forests. 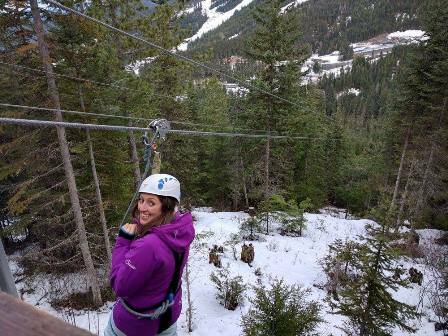 For the more adventurous, there’s no better way to get the adrenaline pumping than with a ZipTrek Tour through the forest – an experience enjoyed by all Oyster participants as part of their orientation on arrival in Whistler. There is also the opportunity to take a snowmobile tour of the mountains, get deep into the forests and learn traditional knowledge on a snow shoeing excursion, and try your hand at dog sledding. 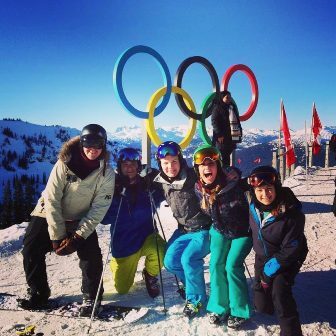 Check out what our own Oyster participants have been getting up to in Whistler this winter by having a look at our blogs. Fancy getting out to enjoy the winter season in Whistler yourself? Read more about our hospitality and ski instructor programmes in this world class resort, or have a look at what we offer in Canada as a whole.